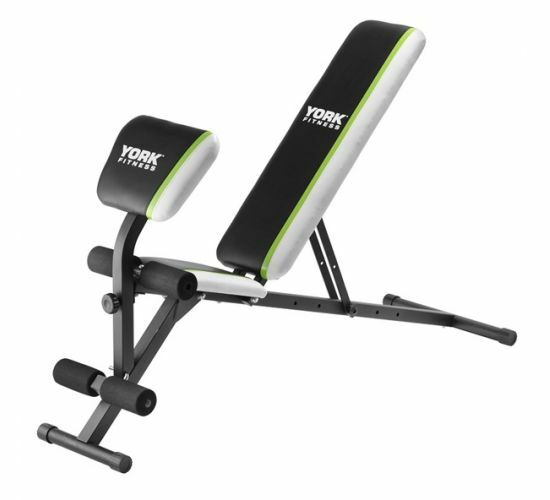 TheWarriorBench is a new and exquisite training bench manufactured by YorkFitness and it’s essentially a small multi-bench for training. Itfeatures a modern and very strong construction, comfortable cushionsand luxurious tapestry. It can be set in 4 different angles-positions(decline, flat, semi-incline, incline) so that you can performangle-specific training. When on decline position, this bench is alsoideal for abdominal training. Warrior Bench has a detachable cushionfor arms training and you can completely remove it for moreconvenient and more comfortable training of your upper body musclegroups. It includes foamy cushions for feet support. When not in use,the bench can be easily folded and stored behind any door or underyour bed (depending on bed’s structure and height) saving valuablespace. When folded, the bench takes up to 21cm of space. It can holdup to 200kg (your body weight + resistance weights). Package includesa photo-map with all the exercises you can perform by using theWarrior Bench.